A one-of-a-kind author's proof of 'The Man With The Golden Gun' has emerged that contains Ian Fleming's revisions to his original manuscript for his final James Bond novel. The corrected typescript is 182 numbered pages of typed foolscap, with five further preliminary pages and a single sheet of suggested (later adopted) corrections by Kingsley Amis, all bound in a cloth folder. Authorial revisions in Ian Fleming's handwriting cover approximately 80 pages with further editorial revisions in green and black ink. Fleming's corrections are mainly quite significant, rewriting entire sentences, adding or removing paragraphs, etc. Fleming wrote 'The Man With The Golden Gun' at his Jamaican retreat, Goldeneye, in the early months of 1964, as was his custom. 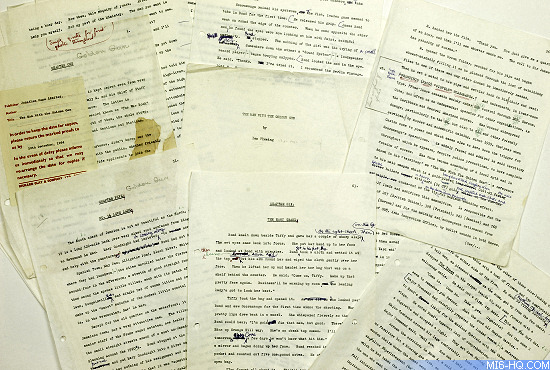 Fleming's original text was completed by April and, as had become routine in the preparation of his books, he had ‘clean' copies typed up for editing. The text was sent in stages, and on 24 July, three typescripts extending to 182 pages, with initial sub-editor corrections, were returned. The following day, Fleming's secretary wrote to the typist, "I've sent one typescript to Mr. Fleming and will do a list of your corrections for him." This is that typescript. Fleming made some (presumably light) revisions and sent the typescript to his friend and Cape reader, William Plomer, with the instructions that it was "unrevised" and not to show it to anyone else other than Michael Howard, director of Cape. Plomer wrote to Howard that he "much enjoyed the book as it is" but Fleming was unsatisfied with the novel as it stood and asked for the typescript to be returned to him, stating that he "would personally like to take it back to Jamaica and paint the lily next year". It would appear that Fleming began this process immediately as much of the more substantial alterations have the effect of tightening the prose. He revises some key moments, such as the description of Scaramanga's "golden gun" (p.26), but the most telling change is the addition of a paragraph to the very end of the novel, which gives a vivid insight into Fleming's troubled state of mind in his final weeks: "At the same time, he knew, deep down, that love from Mary Goodnight, or from any other woman, was not enough for him. It would be like taking 'a room with a view'. For James Bond, the same view would always pall." The visit to Jamaica was never to happen. Fleming's health, which had been poor for some time, went into rapid decline and he died on 12 August. 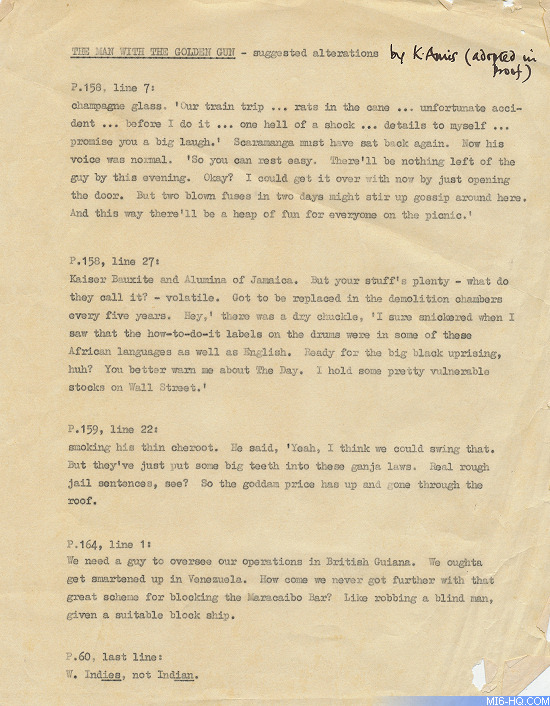 This typescript therefore almost certainly contains Fleming's last ever work on James Bond. In Fleming's absence, Kingsley Amis, fellow Cape author and keen student of the Bond oeuvre, was brought in to tidy up the editing process. 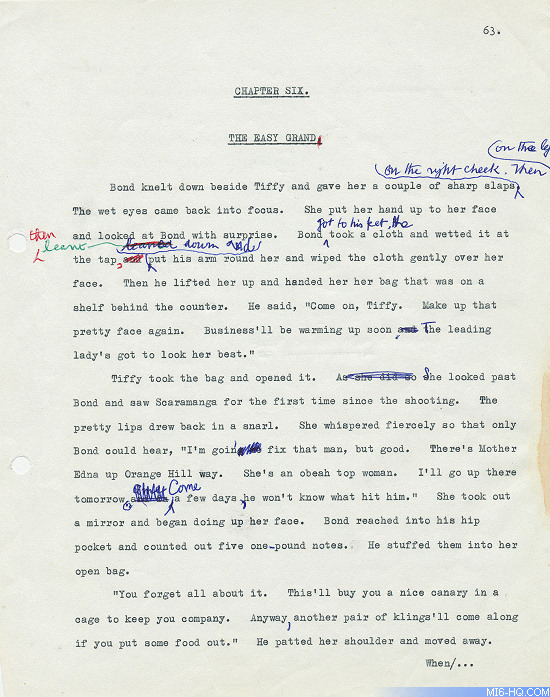 Although Fleming's long-time editor William Plomer was responsible for all the eventual edits for ‘The Man With The Golden Gun', Amis had also suggested changes to the manuscript prior to publication. In correspondence with Tom Maschler (managing director of Fleming's publisher, Jonathan Cape) in October 1964, Amis noted numerous errors that "could easily be spotted by a competent reader". Amis also critiqued Fleming's story, noting that Scaramanga was too thin and insipid a character compared to past villains, and analysed plot flaws revolving around Bond being hired as a security man — despite Scaramanga's lack of knowledge of him and 007's own sense of a trap. Amis concluded that the only way the plot could have worked was if Fleming had intended Scaramanga to be sexually attracted to Bond. Although he suggested that he could perform a "re-jig", Amis was opposed to making substantial changes to Fleming's work. Maschler responded, shooting down his theories on Scaramanga, but Amis would continue to speculate, later noting that "the promising hints of homosexuality and pistol-fetishism in him left undeveloped". It is long been believed that none of his recommendations or edits were used, though Amis received 25 guineas for his efforts. This author's corrected typescript shows, for the first time, the corrections on the original proof by Amis that were adopted in the final manuscript. When the novel was finally published, Amis reviewed it for a newspaper and called it "lifeless". This 'author's corrected typescript' for 'The Man With The Golden Gun' is for sale by Jonkers Rare Books for £150,000.